The Philippine bishops on Sunday made their strongest attack yet on the violent policies and massive death toll which President Rodrigo Duterte’s war on drugs has taken. Describing it as “unacceptable”, they called on the faithful to resist this campaign of extrajudicial executions by police and vigilantes. In a pastoral letter read out at Masses across the South East Asian nation, whose population of over 100 million is predominantly Catholic, the bishops also decried the indifference of those who don’t care about what is happening. “To keep silent in the face of evil is to be an accomplice,” they said as they hit out at President Duterte for creating a “reign of terror” among the poor. More than 7,000 killings have been recorded in just seven months since President Duterte launched a campaign against drug pushers and users. “One killing is a killing too many – we have seven thousand,” the bishops stated. 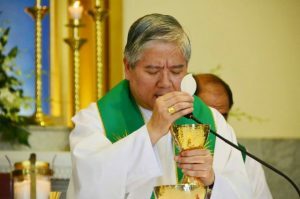 In their pastoral letter, they said Philippine officials have no right to take away life, as they are God’s stewards and not the owners of life. There have been reports of bounties paid to police officers for killing. Last week, Amnesty International accused the Philippines’ police of hiring contract killers. The Bishops’ Conference of the Philippines stressed that killing people was not the answer to the trafficking of illegal drugs, and added that it was disturbing that many didn’t care about the bloodshed, and even approved of it. Both the government and police have strenuously denied that extrajudicial killings have taken place. In the current issue of the Far East Magazine, Columban missionary Fr John Keenan writes about his first-hand experience of the war on drugs. The Irish priest stresses that the root cause of drug addiction is poverty and that the human cost of the war on drugs is enormous.